A little while ago I moved, which caused an idea to sprout for a drink, not necessarily the greatest of ideas, but a daydream based more on garnishing than flavor. 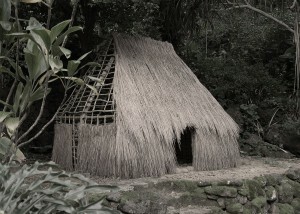 I thought of the thatched roofs of the Pacific Islands, and then more specifically Hawai’i’s ancient Hale Pili, meaning “house thatched with pili grass.” The idea asked a serious question: Do I truly want to make a house as a garnish? 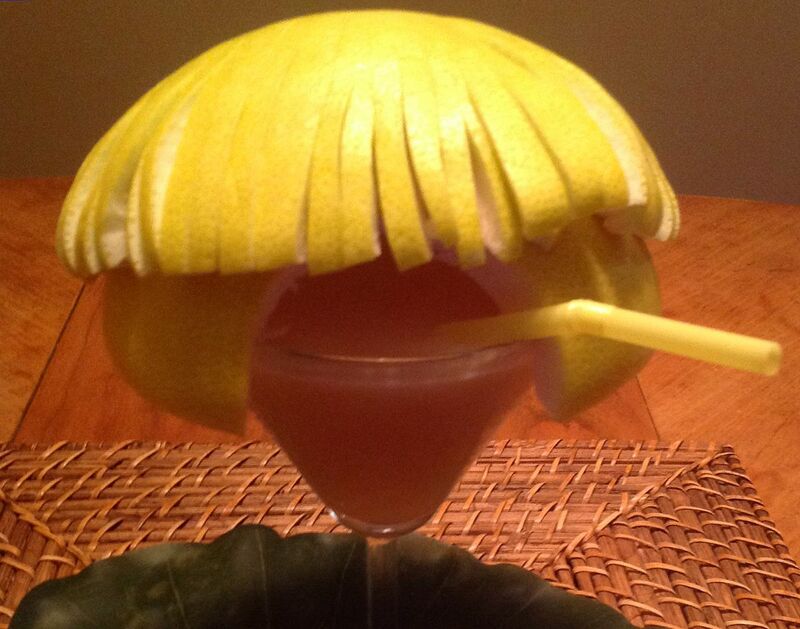 After too much time passed it occurred to me of my failing to build the drink was due to the garnish. The untested recipe written on paper stalled due to an appearance, which felt embarrassing a bit. The ideal chained the idea. I stubbornly decided to garnish the use of the fruit flavors (which provided the aromas as well), and moved on with my life by making the drink. Plus, I wanted to taste this drink and looked forward to proving how much I thought I would like it. However, at the moment of decision, the original garnish came back to me in another way. The thatched roof idea did not turn out successfully in the end. I included it just because it took me so long to formulate the idea, but more for your amusement in the dumb-looking drink. Below is an image of what the historical Hale Pili looked, and then my poor excuse of an over-elaborate garnish (the peal of a pomelo). Then farther down is what I drank. Think of the early Beatles – and one of them with a cigarette in his mouth. I aimed for some flavors of Hawai’i: Pineapple, coconut, ginger, jabong, and ohia ‘ai, a mountain apple, hoping for a balance of sweetness to sourness, but most of all what delights the harvest there can bring. I know there are many ingredients, that is separate flavors, in the drink, perhaps too many. Yet, some flavors teamed with similars, and complicated the final combing into an imagined setting of the islands, hopefully not muddying, but layering flavors. I heard a pomelo would approximate the flavor of the jabong, as well as hearing a mixture of a tart apple and a pear resembles an ohia ‘ai. Of course I am likely wrong in hearing these. After all, what ratios of sour apple and pear should I have added to equivocate the resemblance to the mountain apple? And I certainly could not have tested the guess by comparing it with the genuine. Kōloa coconut rum, an excellent and accurate product, tasting remarkably fresh and clean, my favorite coconut rum brand, I travelled pretty far to use this bottle (Miami Rum Festival). I felt brown sugar, instead of white or raw, might offer a deeper, richer flavor to round the fruits together, not a dark brown, but a light brown sugar. 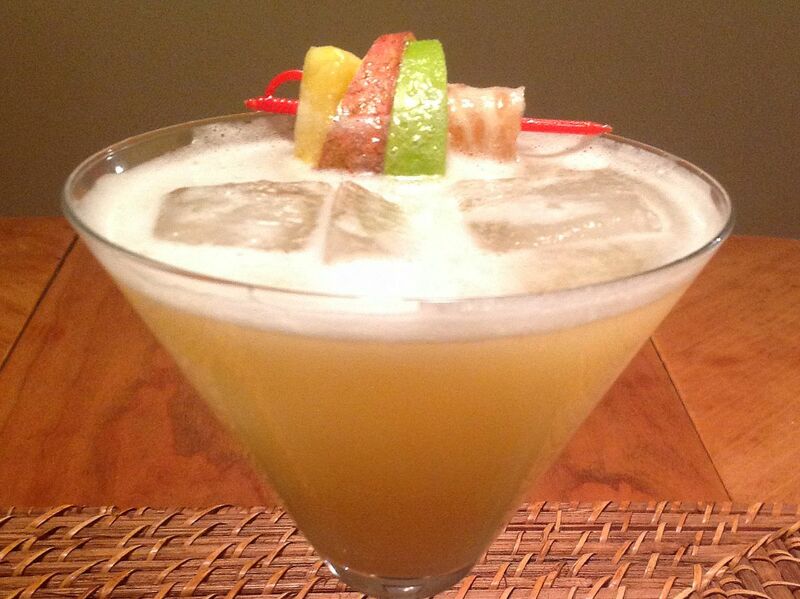 However, the key to this drink truly is its fresh fruit, and how they luxuriously mingle. So fresh and light – a bit of work, but without fail, very much worth it. Make sure to eat this garnish with all combined flavors. Muddle fruit & root with syrup and bitters. I had better luck muddling the apple first alone (cut into small chunks), then adding the ginger, then the rest of the fruits. Add the rum. Shake and double-strain into a chilled cocktail glass. Garnish with grass hut looking roof, or skewering the pineapple/pomelo/apple & pear. Add cocktail straw…or not. Add large pieces of ice if you are in no hurry. This drink is not hot, but an extremely pleasant sipper. Enjoy. This entry was posted in Hale Pili and tagged Angostura bitters, coconut, ginger, Hale Pili, Hawaii, jabong, Kōloa, Miami Rum Festival, mountain apple, pear, pomelo by Jack. Bookmark the permalink.